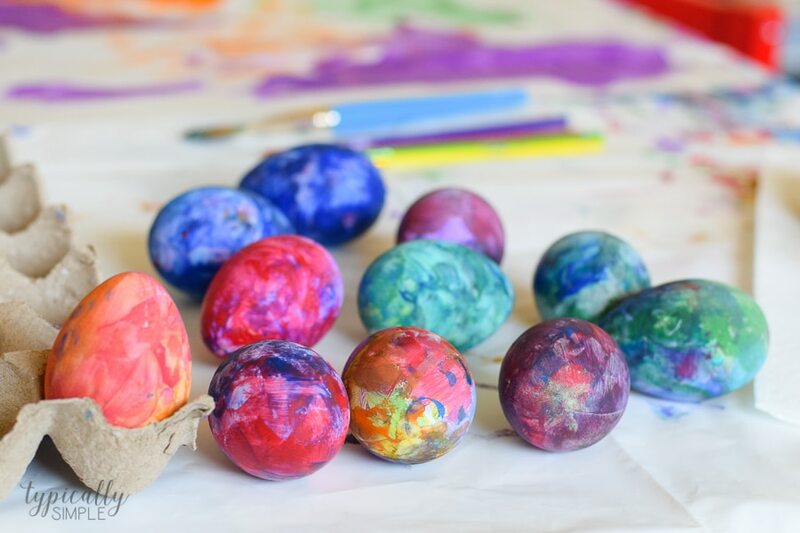 A fun alternative to using dye, grab some paint supplies to make these bright and colorful painted Easter eggs with the kids! I’m always a big shop after the holiday kind of shopper because I can never pass up a good deal on holiday decor. And most of the time I can usually find a few cute things still leftover that are marked 75% off. 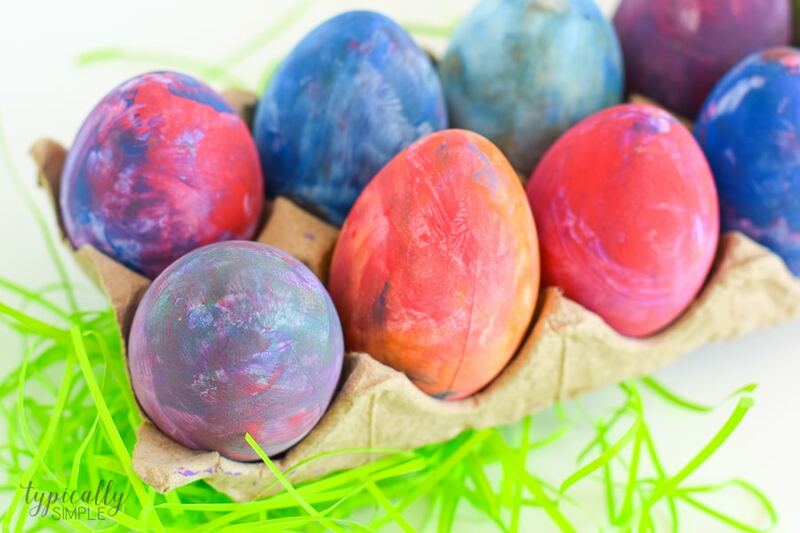 Last year I came across these cute little paper mache eggs in the clearance Easter section, so I grabbed a few packs with no plans for them, but you know…such a great deal! 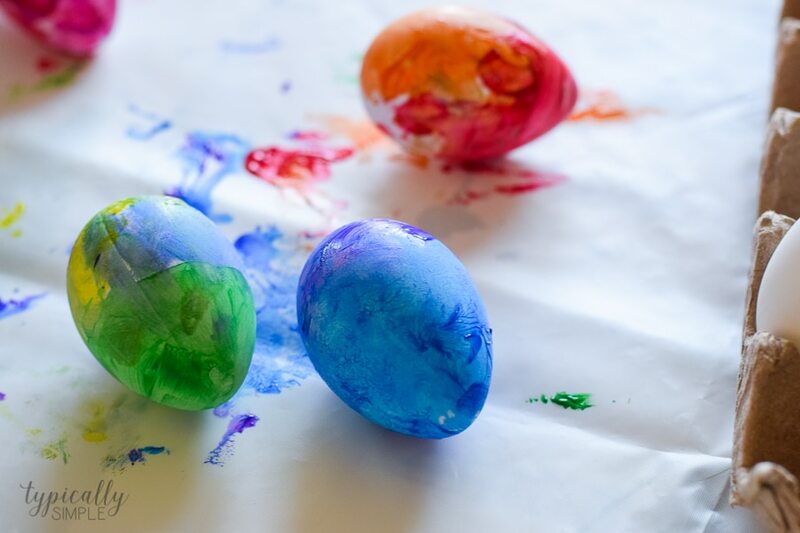 So this year, I pulled them out as props for my Peanut Butter Eggs recipe post, and my little guy decided that they would be fun to play with. He would hide them from himself then go on an Easter egg hunt. Which then turned into him saying that he couldn’t find them because they were plain white and he can only find colorful eggs. The reasoning of a three year old. 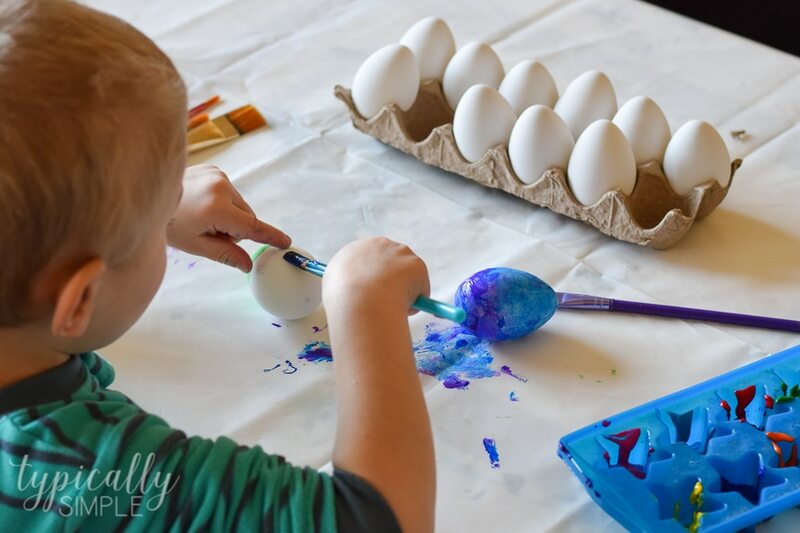 Since he loves to do art projects, but I didn’t want to deal with setting up the vinegar & food coloring to dye paper eggs, I decided to give him some paint and let him decorate the eggs however he wanted. While watching him paint, I thought for sure these eggs were going to turn brown, but I was pleasantly surprised with how they turned out! Plus the project kept him busy and engaged for at least a half an hour. A huge win in my book! 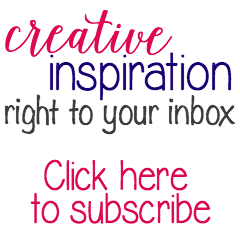 Pour a variety of colors onto a paper plate or my favorite paint holder – an ice cube tray! I love that the paints stay somewhat separated to help prevent the inevitable mixed brown. I also like to provide a bunch of paint brushes so that the colors don’t mix as much. 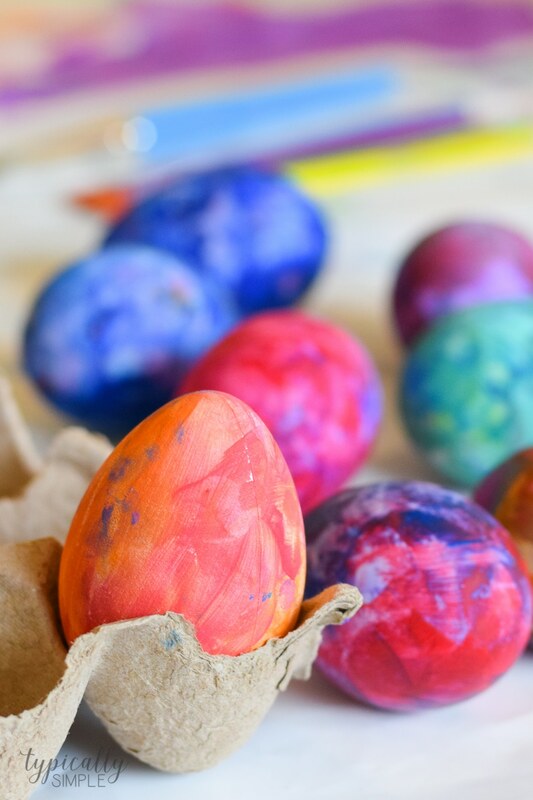 Paint the eggs and allow to dry. Paint a second coat if necessary. 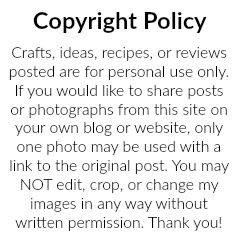 This would be such a fun project to learn about mixing colors. 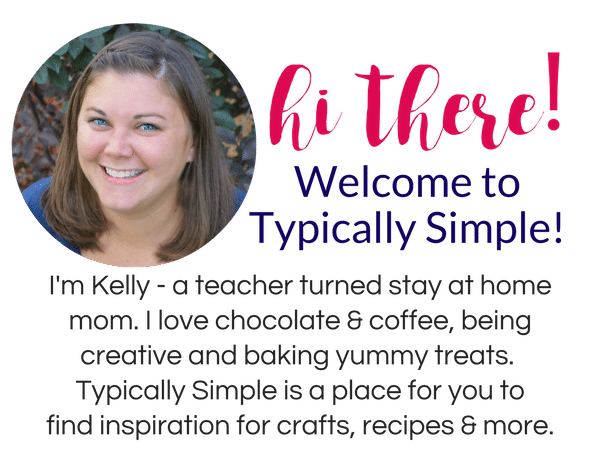 Or just make this a fun, free paint activity and see what the kiddos come up with on their own! 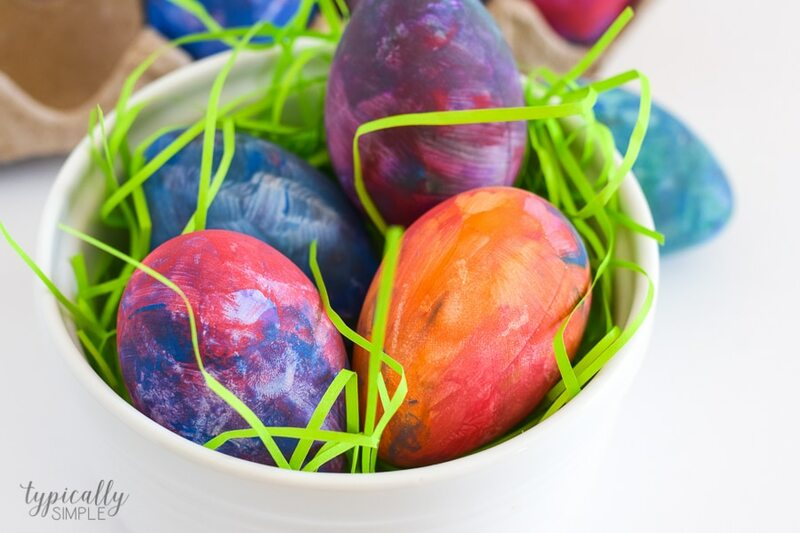 And the painted eggs look so fun sitting in a bowl full of Easter grass. This would make a super cute table centerpiece or even a fun homemade gift for Grandma! 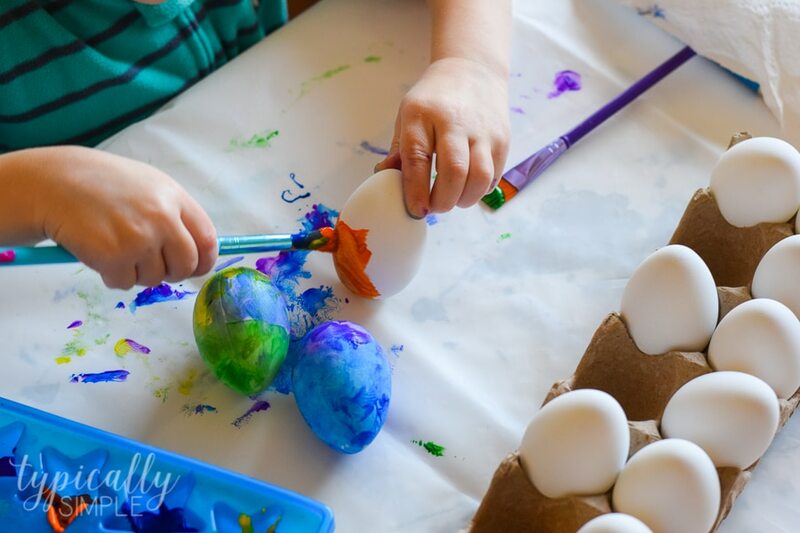 I’m definitely going to be keeping my eye out again for some more paper mache eggs in the Easter clearance section – there are just so many other fun ways, besides painting, to decorate them!